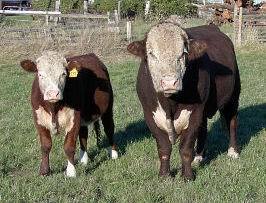 Eldon Murray raises a limited number of Polled Hereford beef cattle each year. No unnecessary chemicals or hormones are utilized in raising these cattle, nor are they grain fed. The result is a healthier and leaner beef than is commonly found in the market today. If you would like to purchase this quality beef please contact Eldon, to have your name added to the reservation list. Most years, the limited supply is completely sold-out long before the Fall roundup, so book early!